His Holiness Patriarch Mor Ignatius Aphrem II presided over the meetings of the General Secretariat of the Holy Synod, which were held at the Patriarchal Residence in Mor Jacob Baradeus Monastery in Atchaneh, Bikfaya – Lebanon, on April 4 and 5, 2016. On April 4th and 5th, 2016, His Holiness Patriarch Mor Ignatius Aphrem II presided over the regular meeting of the General Secretariat of the Holy Synod, held at the Patriarchal Residence in Mor Jacob Baradeus Monastery in Atchaneh, Bikfaya – Lebanon. After the opening prayer, His Holiness discussed with their Eminences the Archbishops, members of the General Secretariat, the matters listed on the agenda of the meeting. His Holiness reviewed the developments concerning the issue of the abduction of their Eminences the Archbishops of Aleppo Mor Gregorius Youhanna Ibrahim and Boulos Yaziji. The Fathers emphasized the importance of following up all efforts that might lead to their release, appealing to all the faithful members of the church throughout the world to continue praying for them. verius Malke Mourad, Patriarchal Vicar in Jerusalem, Jordan and the Holy Lands. They denounced the abusive way in which His Eminence was arrested. They considered it to be a humiliation to all the faithful of the Syriac Church throughout the world. 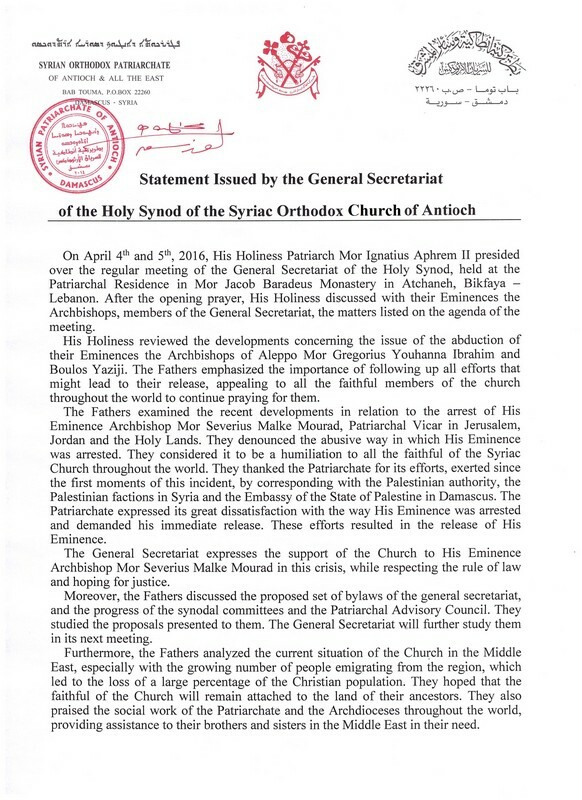 They thanked the Patriarchate for its efforts, exerted since the first moments of this incident, by corresponding with the Palestinian authority, the Palestinian factions in Syria and the Embassy of the State of Palestine in Damascus. The Patriarchate expressed its great dissatisfaction with the way His Eminence was arrested and demanded his immediate release. These efforts resulted in the release of His Eminence. The General Secretariat expresses the support of the Church to His Eminence Archbishop Mor Severius Malke Mourad in this crisis, while respecting the rule of law and hoping for justice. Moreover, the Fathers discussed the proposed set of bylaws of the general secretariat, and the progress of the synodal committees and the Patriarchal Advisory Council. They studied the proposals presented to them. The General Secretariat will further study them in its next meeting. Furthermore, the Fathers analyzed the current situation of the Church in the Middle East, especially with the growing number of people emigrating from the region, which led to the loss of a large percentage of the Christian population. They hoped that the faithful of the Church will remain attached to the land of their ancestors. They also praised the social work of the Patriarchate and the Archdioceses throughout the world, providing assistance to their brothers and sisters in the Middle East in their need. This entry was posted in Featured News, News and tagged Bikfaya Lebanon, General Secretariat, His Eminence Archbishop Mor Se, His Holiness, Holy Synod by Orthodoxy Cognate PAGE. Bookmark the permalink.